and Otto, Surgeon-General Barnes, Drs. Stone, Crane and Leale, Major John Hay, and Maunsell B. Field. the 2nd Connecticut Volunteer Artillery. I was serving with my regiment, the 2nd Ohio Cavalry along the Cumberland in Southern Kentucky in the latter part of the year 1863, when the Judge Advocate on the staff of General Burnside, Major J. Madison Curtis (brother-in-law of the late Senator Douglas), committed an offense for which charges were preferred against him. General Burnside sent inquiries to the front for some officer who was a lawyer, and who could be recommended as capable of trying his Judge Advocate. I was recommended, and ordered back to Cincinnati, where General Burnside's headquarters then were, as commander of the Department of the Ohio. After finishing this case, I was kept on court-martial duty at Cincinnati, Lexington and Louisville for some time and, finally at the request of Governor Morton in September 1864, I was ordered to Indiana to act as Judge Advocate of the court detailed to try the members of the "Knights of the Golden Circle" or "Sons of Liberty." These trials were finished sometime in December of that year, and I entered almost immediately upon the trial of the Chicago conspirators -- St. Leger, Grenfel, and others, who had come over from Canada to engage in the enterprise of releasing the rebel prisoners then in Camp Douglas near Chicago. While making the closing argument in this case, on the 17th of April, 1865, I received a dispatch from the Secretary of War, directing me to report in person immediately to the War Department to aid in the examinations respecting the murder of the President. I started for Washington the same evening, reached there on the morning of the 19th, and was "specially assigned by the Secretary of War for duty on the investigation of the murder of President Lincoln and the attempted assassination of Mr. Seward", and a room was assigned to me in the War Department. The gloom of that journey to Washington and the feeling of vague terror and sorrow with which I traversed its streets, I cannot adequately describe, and shall never forget. To this day, I never visit that City without some shadow of that dark time settling over my spirit. All the public buildings and a large portion of the private houses were heavily draped in black. The people moved about the streets with bowed heads and sorrow-stricken faces, as though some Herod had robbed each home of its first born. When men spoke to each other in the streets, there were tremulous tones in their voices, and a quivering of the lips, as though tears and violent expression of grief were held back only by great effort. In the faces of those in authority -- Cabinet ministers, officers of the army, -- there was an anxious expression of the eye as though a dagger's gleam in a strange hand was to be expected; and a pale determined expression, a set of the jaw that said: "The truth about this conspiracy shall be made clear and the assassins found and punished: we will stand guard and the Government shall not die." For no ruler who ever lived, I venture to say, not excepting Washington himself, was the love of the people so strong, so peculiarly personal and tender, as for Abraham Lincoln. Especially was this so among the soldiers; all members of the old army will remember with what devotion and patriotic affection the boys used to shout and sing, "We are coming, Father Abraham!" and will remember what a personal and confiding sort of relation seemed to exist between the soldier boys and "Uncle Abe", and how those brave soldiers -- veterans of four years of terrible war, inured to hardship, to sickness and wounds, familiar with the face of death -- wept like little children when told that "Uncle Abe" was dead. The scene at the bedside of the dying President has been described in the Press, and as the news swept around the earth, all the children of men, in all the civilized world, wept with those about his couch. That death-bed scene will never be forgotten. It was surrounded by his Cabinet ministers, all of whom were bathed in tears, not excepting Mr. Stanton, the War Secretary, with iron will and nerve, who when informed by Surgeon-General Barnes that the President could not live until morning exclaimed: 'Oh, no, General! no, no', and immediately sat down at his bedside and wept like a little child. "Senator Sumner was seated on the right of the President's couch near the head, holding the right hand of the President in his own. He was sobbing like a tender woman with his head bowed down almost to the pillow of the bed on which the President was lying." At twenty-two minutes past seven, the President passed away and Mr. Stanton exclaimed, "Now he belongs to the ages." Besides the persons named, there were about the deathbed his wife and son, Vice-President Johnson, all the other members of the Cabinet with the exception of Mr. Seward, Generals Halleck, Meigs, Farnsworth, Augur, and Ladd, Rev. Dr. Gurley, Schuyler Colfax, Governor Farwell, Judges Carter and Otto, Surgeon-General Barnes, Drs. Stone, Crane and Leals, Major John Hay, and Maunsell B. Field. 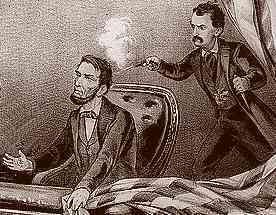 When I entered upon the duty of assisting in the investigation of the murder of the President, on the 19th of April, it must be borne in mind that at that time, it was not positively known who had assassinated the President, or attempted the life of Secretary Seward; Booth was the alleged assassin. How wide-spread was the conspiracy or who were in it, or of it, was not known. There was general apprehension and belief that further assassinations would be attempted, and guards were placed around the primary residences of the Cabinet ministers, General Grant's house, and the public buildings; soldiers patrolled the City, and were scouring the country. 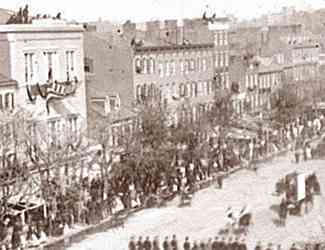 All that was positively known as to the assassination of the President, was that a tall dark man, apparently about thirty years of age, had forced his way into the Preisdent's box at Ford's Theatre on the evening of the 14th, had shot the President: stabbed Major Rathbone who attempted to detain him, had leaped over the front of the box onto the stage below, fled across it crying, "Sic semper Tyrannis!" -- then out by the right side to the rear door of the theatre, had there mounted a horse, galloped away into the night crossing the Navy Yard bridge; that another supposed confederate soon after galloped after him and joined him, and this was the sum of the positive knowledge at that time. Of that scene in the box at the Theatre, and on that night, Nicolay and Hay in the Life of Lincolnsay, "The whole performance remains in the memory of those who heard it, a vague phantasmagoria, the actors the thinnest of specters. The awful tragedy in the box makes everything else seem pale and unreal. "Here were five human beings in a narrow space -- the greatest man of his time in the glory fo the most stupendous success in our history, the idolized chief of a nation already mighty, with illimitable vistas of grandeur to come: his beloved wife, proud and happy; a pair of betrothed lovers, with all the promise of felicity that youth, social position, and wealth could give them; and this young actor, handsome as Endymion upon Latmus, the pet of his little world. "The glitter of fame, happiness and ease was upon the entire group, but in an instant, everything was to be changed with the blinding swiftness of enchantment. Quick death was to come on the central figure of that company -- the central figure we believe, of the great and good men of the century. Over all the rest the blackest fates hovered menacingly -- fates from which a mother might pray that kindly death would save her children in their infancy. "One was to wander with the stain of murder on his soul, with the curses of a world upon his name, with a price set upon his head, in frightful physical pain, till he died a dog's death in a burning barn; the stricken wife was to pass the rest of her days in melancholy and madness; of those two young lovers, one was to slay the other and then end his life a raving maniac." At the same hour that Booth fired the fatal shot, Payne appeared at the door of Secretary Seward's house, in the guise of a mesenger from Dr. Verdi, holding in his hand the package that Booth had prepared for him, and demanded to see the Secretary, saying that he had a verbal message which was of particular importance in regard to the use, or application of the medicine, and that he must see the Secretary himself. Dr.Verdi had left his patient but a short time before, and had consoled the family that had for days been suffering the greatest anxiety on account of the Secretary's condition, by taking a favorable view of the symptoms. The family worn with watching and anxiety, were disposing themselves for the night. 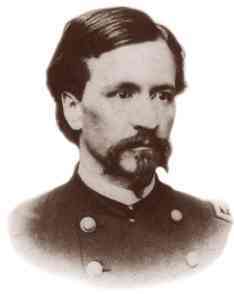 Sergeant George P. Robinson, acting as attendant nurse, was watching by the bedside in company with Miss Seward, the Secretary's daughter. 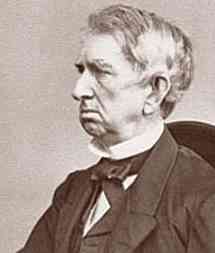 Frederick D. Seward occupied the room at the head of the stairs. All the rooms occupied by the Secretary and his family were on the second floor, and were reached by a flight of stairs in the hallway. The second waiter, William H. Bell, a colored lad of nineteen was stationed at the hall door. Being somewhat relieved of their anxiety by the doctor's favorable view of the case, all were anticipating a night of quiet rest. The doorbell rang and was responded to by Bell, the colored waiter. Immediately upon the opening of the door, Payne stepped into the hall. He was a tall, broad-shouldered, muscular man, as agile and ferocious as a panther; a low-browed, scowling, villainous-looking specimen of humanity, the animal predominating largely in every feature of his visage and expression of his countenance. There he stood, holding in his left hand the package, and keeping his right hand in his overcoat pocket. He demanded of the boy to be allowed to see the secretary, telling his story about being sent by Dr. Verdi to deliver them edicine with his directions. The porter told him that his orders were to admit no one, and that he could not see Mr. Seward; that he would deliver the package himself. To this Payne would not comment, but persisted in saying that he must see Mr. Seward. After considerable parleying, he started upstairs, and the porter, seeing that he would go, and thinking that he might complain of his conduct to the secretary, asked him to pardon him, to which Payne replied: "Oh, I know; that's all right." He was wearing heavy boots and took no pains to walk lightly as he went up the stairs, whereupon the porter requested him not to make so much noise, to which, however, he paid no attention. 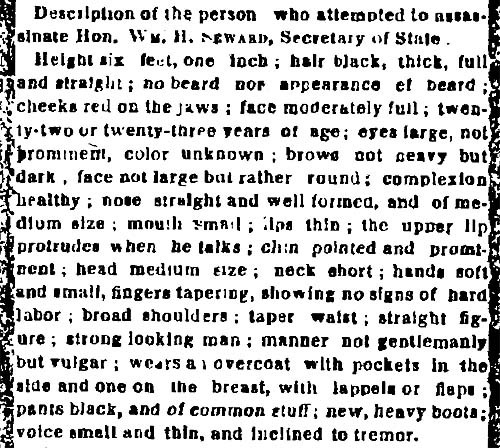 As he approached the head of the stairs, he was met by Mr. Frederick Seward who had been attracted by the noise, to whom he said, "I want to see Mr. Seward." Frederick went into his father's room, and finding him asleep, returned saying, "You cannot see him." All this time Payne stood holding the package in his left hand, grasping with his right hand the pistol in his overcoat pocket. Frederick requested him to give him the package, saying that he would deliver it; but Payne persisted in saying that that would not do, he must see Mr. Seward -- he must see him. Frederick finally said, "I am proprietor here, and his son: if you cannot leave your message with me, you cannot leave it at all." Payne still continued parlaying with Frederick for some time; but finding that his talking availed nothing, he started as if to go downstairs. This, however, was only a feint on his part in order to throw Frederick off his guard and to get rid of the porter who stood behind him. He again walked so heavily that the porter requested him not to make so much noise; but at that moment, Payne having prepared himself for the encounter, turned quickly, and making a spring towards Frederick, struck him two or three times with the pistol, which he had all the time held in his hand, fracturing his skull, and knocking him senseless to the floor. Having learned which was the room occupied by the invalid by seeing Frederick go into it, Payne rushed past the prostrate man, opened the door of the Secretary's room, and was met by Sergeant Robinson. Having broken and thrown down his revolver in his encounter with Frederick, he had drawn his dagger, and at his first encounter with the Sergeant, he struck him with the knife, cutting an ugly gash in his forehead and partially knocking him down. He then pressed rapidly forward, knife in hand, to where the invalid lay in his bed. Throwing himself upon him, he commenced striking at his face and neck with his dagger. The Secretary was reclining in a half-sitting position, having the coverings well drawn up about his neck and chin, to which circumstances the failure of the wouldbe assassin to take his life was no doubt due. The Sergeant as soon as he recovered his feet, sprang upon Payne, and Major Seward, having been awakened by the screams of his sister, sprang into the room in his night-dress. Finding the Sergeant grappling him in such a way as to hinder the effectiveness of his thrusts at the Secretary, and probably thinking that he had accomplished his purpose, the assassin turned his attention toward making his escape. In disentangling himself from the grasp of the two men who now had hold of him, he gave Major Seward several severe cuts about the head and face, crying all the time, "I am mad! I am mad!" Finally tearing himself loose, he started to make his way to the street. Meeting a Mr. Emrick W. Hansel, another nurse, on the stairs, he made a thrust at him with his knife, inflicting an ugly wound. He now left the house leaving five of the inmates stabbed, cut and bleeding behind him. Having reached the street, he deliberately threw his dagger away, mounted the horse which he had hitched in front of the door, and rode off. After the attack at Secretary Seward's, Dr. Verdi and two or three other surgeons were at once called to examine and treat the Secretary and the other victims of Payne's dagger. The house in which the onslaught was made had the appearance of a charnal house or slaughter-pen. The Secretary was found to have received three or four severe cuts about the face and neck, which were only made dangerous by the loss of blood they had occasioned and the weak condition of the patient. The Secretary made a slow but good recovery. Of the other four wounded men, the wounds of Mr.Frederick Seward proved the most serious, as his skull had been fractured and depressed, so as to render him unconscious, from which condition he was only recalled by a surgical operation. All finally recovered. On the evening of the 14th, Booth had called at the Kirkwood House, where Vice-President Johnson was stopping, and left a card on which was written: "Don't wish to disturb you. Are you at home? J. Wilkes Booth." 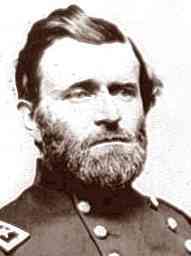 On the evening of the 13th, a man appeared at Secretary Stanton's house where General Grant was that evening, had asked to have both General Grant and Secretary Stanton pointed out to him which was done. He did not speak to either of them, and lingered in the hall watching them and sat down on a step of the front steps until he was driven away. This was the sum of what was actually and positively known of the facts as to the assassination of the President, the attempted assassination of Secretary Seward, and the movements of the conspirators on the 19th.